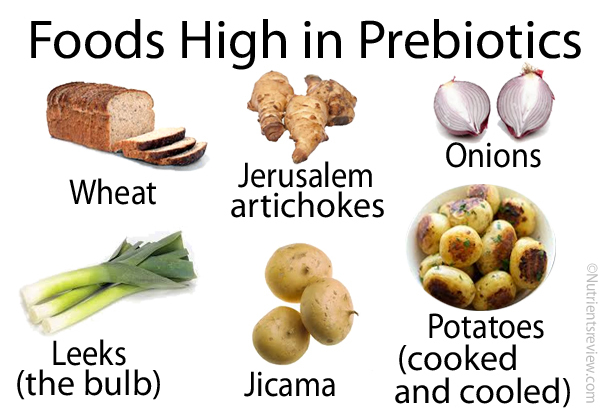 Prebiotics are indigestible carbohydrates that selectively promote the growth of the beneficial large intestinal bacteria, such as Bifidobacteria and Lactobacilli, associated with health and well being [1,5]. Bacterial breakdown (fermentation) of prebiotics yields gases and short-chain fatty acids (SCFAs), which feed bacteria themselves and colonic lining cells; some of SCFAs are absorbed and provide some energy (1-2 kcal/gram prebiotics) . Prebiotic supplements currently on the market usually contain inulin or fructo-oligosaccharides (FOS). What has been proven so far is that prebiotics selectively promote the growth of beneficial intestinal bacteria. This could help prevent the growth of the harmful bacteria, prevent or treat intestinal infections, diarrhea in infants , allergy (eczema) in infants , necrotizing enterocolitis in preterm infants , irritable bowel syndrome (IBS) , inflammatory bowel disease (Crohn’s disease, ulcerative colitis), improve immunity, prevent colorectal cancer , increase satiety and reduce blood glucose spikes after meals , reduce blood cholesterol , help in weight loss, increase the absorption of calcium, magnesium and iron and prevent constipation, but non of these effects have been firmly proven, yet . Prebiotics, especially inulin and fructo-oligosaccharides (FOS), consumed in high amounts can cause abdominal bloating, excessive gas (flatulence), loose stools or diarrhea . 1. What is difference between prebiotics and probiotics?